DIY - Yard Sale fundraiser! families on the same street holding yard sales on the same day – either benefiting the same charity or different charities of their choice. 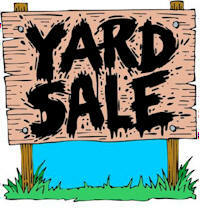 Advertise the yard sale in your local newspaper and using flyers posted in your neighborhood, as a yard sale to benefit “x”. Make sure you have signs at the sale itself reminding people about the cause. You may even want to have information about the cause available to your customers so they know more about your charity. If you are raising money in somebody’s memory or honor, you may want to include a photo or photo collage of that person to add a more personal touch. Alternative – Super Sale Yard Sale: We are an active congregation of only 23 people. All members donated items that were used, new, antique, hand made, and anything they could find. We also had relatives and friends that donated. What made this yard sale unique? We canvassed local businesses and had gift certificates, prizes, food, plates, napkins, plastic ware, soda, ice cream and anything else we needed donated. We paid nothing out of pocket. At our yard sale we had a Chinese auction for the items donated from local businesses, we had a bake sale, and we had a food sale. You have to keep in mind that if you want to sell what you have and not have to pack it back up, you need to sell it at “yard sale” prices. People do not come to yard sales to pay high prices. Everything was donated which means no matter what you charge it’s all profit, so give the buyer a break. Let people know that items they donate will be priced low to sell. This will give them the option of not donating items they want big bucks for.